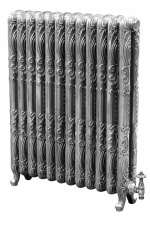 Fluid Art Nouveau runs throughout the Orleans Cast Iron radiators, which are distinctly French in origin, at almost 1 metre tall this radiator makes a real statement. Again this is a unique design, available in a wide selection of finishes or painted in a colour of your choice. You can place your order on-line or call us at the sales office on 01748 821500, we are always there to speak with our customers. The Orleans Cast Iron Radiators now come with a lifetime guarantee and have recently been supplied to a stunning London Town House.